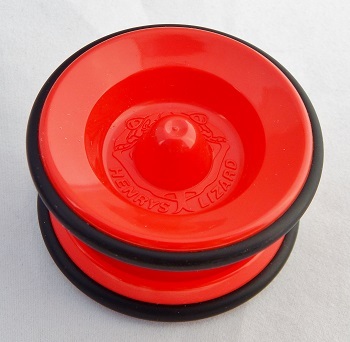 At the time, the Lizard was a new, budget Henrys yo-yo that included the AXYS system--a modular system of four different axles that were completely interchangable. This model has the Slider plastic transaxle bearing pre-installed. The outside perimeter of each halve has black rubber rings. As with all Henrys yo-yos, the string gap was completely adjustable by slightly rotating the halves--another great feature of the AXYS axle system. The original release of the Lizard did not have a response system of any kind molded into the halves and the plastic body came in solid colors only.